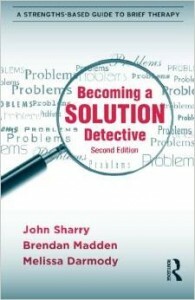 Encouraging the reader to become a ‘solution-detective’ and to look for ‘clues’ to success in their own practice, this is a practical and accessible guide for therapists, counsellors and other professionals interested in making their practice solution focused and effective in a short time frame. Drawing on the insights of solution-focused therapy (SFT) and other strengths based therapies, the book is full of case examples, exercises and role plays, designed to build on your strengths as a practitioner. Becoming a Solution Detective is ideal for individual study and for use on courses in a wide range of fields including social work, counselling, therapy, psychology and nursing. The three authors co-founded the Brief Therapy Group in Dublin, which is a psychotherapy, training and consultation service and the leading provider of Brief Therapy training and consultation to professionals in Ireland. Within their practice, the authors have designed basic and advanced training courses in solution-focused therapy as well as the format for a professional supervision and consultation group. This book instills the insights of their training approach into an accessible guide to practice. Chris Iveson, Brief Therapy Practice.